Our next post comes from Kathryn Lewis from Porthcawl Comprehensive School. Maybe it’s overly dramatic to quote the rousing monologue given by Samuel L. Jackson at the beginning of Paloma Faith’s new album…but then again, perhaps this is the time for a bit of drama! The evolution of our education system is happening, like never before. I have often heard senior leaders referring to our profession as needing “evolution, not revolution”. Evolution may be easier to control, to manage with less risk; however, have we not reached the point of needing both evolution and revolution? If we can live our lives every day knowing President Trump presides over the nuclear button, can we not cope with a little revolution within our profession? ‘Schools are known for being notoriously difficult environments for implementing change’ (Fullan, 1999. Fullan, Hargreaves, 1996. Cited in Kearney, 2002, p.1). Factors such as heavy teacher workload, change-fatigue and perhaps the sense that “things are working fine as they are, why change them?” have contributed to schools remaining largely unchanged for generations. 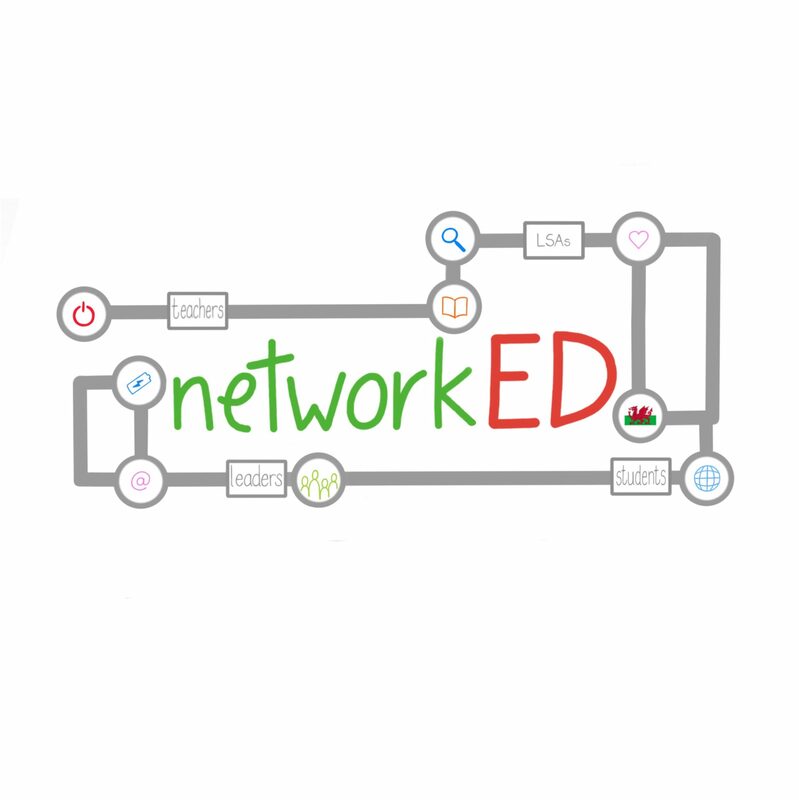 Education still consists, in large measure of a number of disconnected subjects made up of more or less independent items. An experienced adult may supply connections and see the different studies and lessons in perspective in logical relationships to one another and the world. To the pupil, they are likely to be curiously mysterious things, which exist in school for some unknown purpose, and only in school. Those words from American philosopher, Dewey, pre-date the Second World War, yet education has remained relatively unchanged for a further eighty years. Until we heard of a man named Professor Donaldson! He and his team captured the views, needs and wants of our profession in Wales within his ‘Successful Futures’ (2015) document. The Welsh Government boldly accepted all recommendations for change and in perhaps the most surprising but exciting aspect of this whole process, they in turn handed the task over to the profession. No other country in the world has been awarded the freedom we now have of combining colleagues from so many tiers of the education system, in collaboration with active teachers to construct the framework, the vision and the aims of an innovative, new curriculum. Welsh Government have revolutionised the process, thus evolving it so that we are part of the thinking process. They are not presenting us with this; they are consulting with us on it. So why would we sit back and wait for it to be done to us when we have the opportunity to shape it ourselves? It could be said that Mother Nature, having embedded within us the natural instinct of being change-averse, has created a barrier to us embracing this opportunity. Whichever camp you sit in – whether your glass is half-filled or half-empty, or if you’ve moved your chair into the sun or not – change is happening! In my early work as a curriculum pioneer, senior colleagues within the process would talk of the need for schools to embed change management strategies. Until I carried out my own research, I knew nothing of the immense body of work available on managing organisational and imposed changes within workforces. I soon saw how strategic plans could be constructed from models such as Kotter’s Eight Steps (1995) resulting in measurable frameworks upon which schools could progress. It was when I found the work of Kubler-Ross (1969) entitled ‘The Five Stages of Grief’ that I hit an accord, a true resonance with the challenges I was facing as a pioneer and as a teacher. 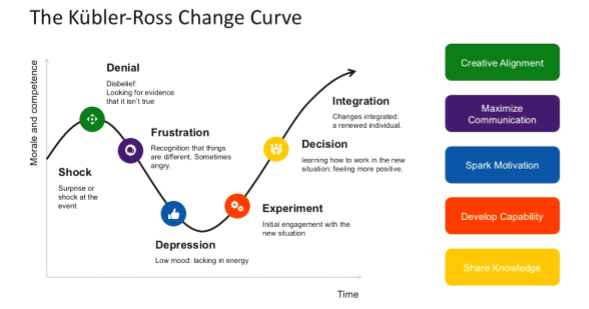 The Kubler-Ross Change Curve offers an emotional view of change that many other models fail to address. Most of us have emotional responses to our curriculum reform. We may initially feel anxious, frustrated, dejected or even resentful of such wide scale change with both pioneer and partner schools not knowing how to move colleagues past those feelings. However, I’ve come to realise that we can stop and examine those feelings (not in too much of a lie-on-the-sofa-listening-to-ocean-sounds type of way) but as an acknowledgement that it’s ok to feel negative, apprehensive and doubtful, they are logical parts of a change process. I have realised that it is only when we have worked through those feelings by questioning and challenging the change, that we can move to the next phase of sparking motivation, interest and excitement for what is ahead of us. Pioneers have had the luxury of being given time and the space to think. They have researched, thought-through, questioned, challenged and debated, which has enabled them to move their chairs out of the gloom of the death and the dying stages of Kubler-Ross’s construct and into the rebirth where they are able to view sunny vistas. I have seen what the future could look like…and it’s exciting! I implore you to engage with your pioneers, with professional networks and to begin a process of change within your schools – no matter how small. We are at a crucial stage where the framework upon which our curriculum sits, along with our What Matters concepts and reference points have been completed. Professional learning pioneers are going to be trialling the work of all AOLEs in the summer term, we will then in turn continue to refine, redraft and improve our offer in preparation for the curriculum becoming available to all in April 2019. This is really happening and if we as a profession come together to support it, Wales will have a high quality offer for our learners that truly supports, motivates and prepares them for life. It is time to achieve an evolution through a revolution. “Know you can change things…the time is now”. Kearney, K.S. (2002). A Study of the emotional effects on employees who remain through organizational change: A view through Kubler-Ross (1969) in an educational institution. Available at: https://shareok.org/bitstream/handle/11244/46844/Thesis-2002D-K24s.pdf?sequence=1&isAllowed=y (Accessed: 19 November 2017). Little, J. (2014). Navigating Organizational Change. Available at: http://leanchange.org/2014/02/navigating-organizational-change/ (Accessed 13 February 2018). Melwin-Joy, M. (2015). Kotters Eight Step Model of Organizational Change – Organizational Change and Development. Available at: https://www.slideshare.net/manumelwin/kotters-eight-step-model-of-organizational-change (Accessed on 13 February 2018). Newton, C., Tarrant, T. (1992) Managing Change in Schools: A Practical Handbook. London: Taylor and Francis. p. 449. Faith, P. (2017). ‘The Architect’. Evolution. RCA Records Label. I’m at a loss as to why only a few are shaping the way forward. Schools embrace change, look forward to it but still it’s the minority that tell the majority what to do. So much money has been spent on ‘pioneers’ yet there is no real move forward. Ther e are many schools out there doing an amazing job on developing ‘Successful Futures’ but they will not be listened to. Who knows those schools may have the most innovative ideas.